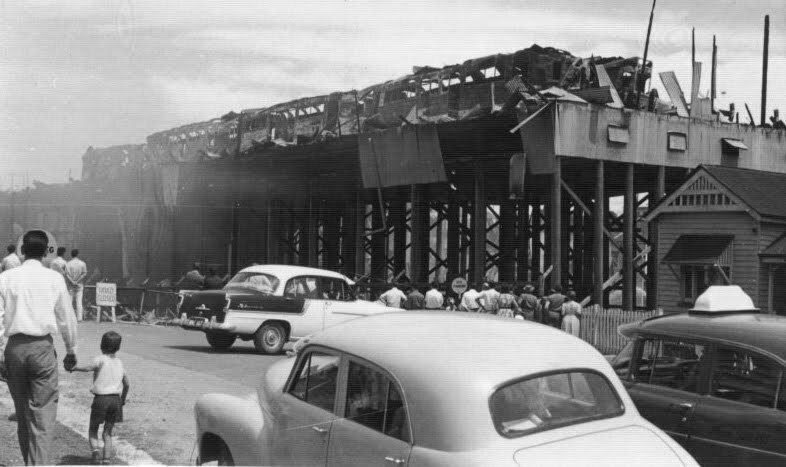 On this day forty-eight years ago, Brisbane residents awoke to news of a terrible fire that would cause public transport chaos in the days ahead. On the night of 28 September 1962, one of Brisbane's fiercest ever fires blazed away at Paddington, destroying the Paddington Tram Depot and with it, 65 of Brisbane's trams. The photograph above shows people coming to see the remnants of the depot, whilst in the photo below, firemen are still spraying water onto the burnt-out shells of trams visible on the upper floor. The picture below, from around the year 1942, shows three buildings that were affected by this fire. The Ithaca Fire Station. 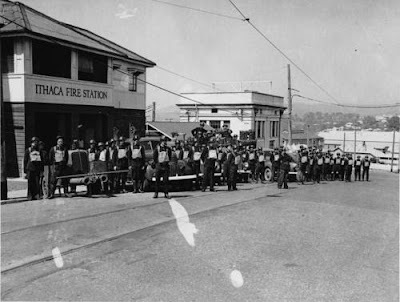 on the left, was the closest fire station to the fire; the square building in the centre of the photograph is the sub-station that provided the electricity for the trams; and the white roof on the far right of the photo is the tram depot. For the news media's take on the fire, click below to see a Flashback story, thanks to Channel 7 Brisbane, who were kind enough to provide it for this blog. 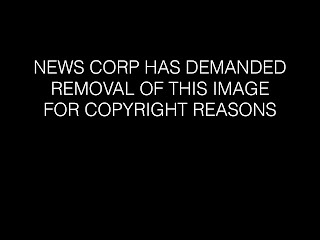 Click your browser's back button to return here after the video is finished. Particularly noteworthy is the news that many of the tram motormen became bus drivers, some not so successfully! In the immediate aftermath of the fire, the first order of business was to restore as much of the tramway service as possible, and to achieve this, whatever spare parts that could be rescued from the destroyed depot were cobbled together to make trams to replace those that were lost in the inferno. These trams were known as "Phoenix" trams, and had their own logo on the front. Next: What type of bus is that? your posts get better and better - i'm mostly a southside bloke, but i did live in Paddington area for six months in the late 90s, i used to shop in that shopping center - i had no idea that it was once a tram depot. 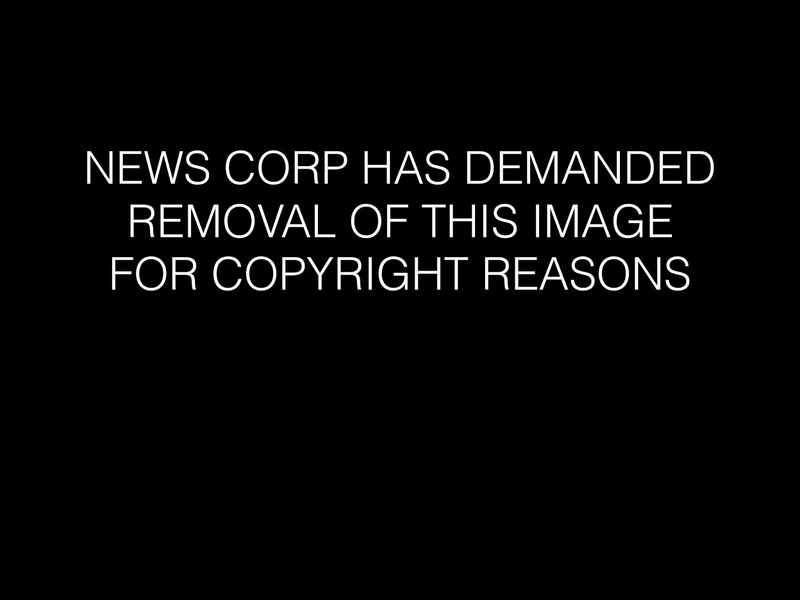 also, love the clips from channel 7, Clem Jones and the pipe smoking chap, priceless! I think (but I am not 100% sure) that the pipe-smoker was town clerk JC Slaughter. 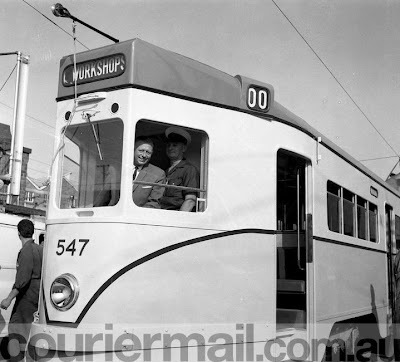 Tram No 547, which you have pictured, was the first of the 'Phoenix' trams, entering service in 1963.